Many people are willing to make a donation to charitable organizations – you just need to connect with them. Writing a Request for Donation Letter is a great way to aid in fundraising, especially when properly written. Whether you're writing a donation request letter for a charity, a church, or other sponsorship, our sample donation letter template can help you get started. Be sure to continue reading after the download box to find sample donation request letters, additional tips to improve your own donation letter and links to additional resources. 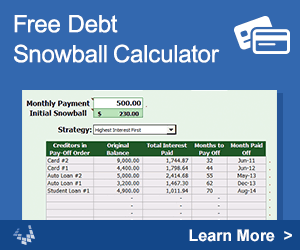 Download and customize this template using Word, OpenOffice, or Google Docs. The information in [brackets] should be replaced with your specific information or details. We can't guarantee the results you will get for sending fundraising letters like this, but this template and the sample donation letters below should at least provide some ideas. Before writing you must know the audience, the goal and the action you are looking for. Use the charity organization's official letterhead and make sure it includes the organization's logo, name, address, phone number and website. Make sure you include the date and the recipient's full address. Personalize the letter as much as possible. People will respond better to personalized letters rather than computer generated letters. For example, address the letters directly to the recipient rather than Dear Sir or Dear Friend. Keep the letter specific and professional. Make your argument using success stories and facts; these will help people feel the importance of your cause. Communicate clearly the organization’s goal for this drive. The organization may have many purposes and projects, but make sure your letter is focused on a particular need. Identify the specific action you wish the recipient to take to help achieve the organization's goal – whether it is donating money, items or time and how much. Provide details on how they can respond including a return envelop if applicable. If you are doing Online Fundraising, then be sure to include the proper website information. You may wish to mention that their donations may be tax deductible if your organization qualifies under IRS guidelines. Be thankful – thank them for their time and their consideration or go ahead and thank them for their donation. Make sure the letters are signed by a real person and include their name and title below the signature. A post script (PS) is appropriate in this form of letter and can convey additional information such as deadlines, goals or a final reference to the story or facts used at the beginning of your message to tie it together. Make sure you send them a Donation Thank You Letter after they have made a contribution. Example request for donation letter, seeking assistance to fund a youth program for boys. In 2009 Number One Nonprofit helped over 350 underprivileged boys participated in Boy Scout activities in our community. They had a chance to learn to swim, learn basic survival and first-aid skills and learn how to work with other boys. More importantly, they were given the chance to develop confidence, to feel wanted and to develop dreams for their future, dreams that have included becoming engineers, accountants, doctors and politicians. Our goal for 2010 is to help 420 boys participate in scouting activities including a full week at summer camp. Thanks to generous sponsors, we are well on our way to reaching our goal, but we still need help supporting the final 150 boys. Will you help us meet our goal to provide these wonderful boys with worthwhile activities by supporting a boy? Your donation will have a dramatic impact on the life of a young man. $150 – Your boy will have a spot at a week long summer camp with activities such as horseback riding, crafts, swimming, canoeing and archery. $250 – Your boy will receive a uniform, a week at scout camp and participate for 1 year in weekly activities. Send your gift directly to us using the included return envelop or, if you wish, you may use our online donation website – www.numberonenonprofit.com. All donations to Number One Non-Profit go directly to the boys we have been helping since 1985. Your gift will have tremendous impact on the life of a boy and help him to have the skills, vision and motivation to change his life. Thank you for partnering with us to help our boys. P.S. – Since activities start the first week in January, our deadline for raising funds is 12/15/2009. This is a sample request for donation letter to support a school music program. The Super Duper Academy is a local school that seeks to help children with disabilities and learning challenges. We currently have enrolled over 200 students and are helping them with our customized and tailored curriculum. We have a dream this year to add a music class in the hopes that each of our students who desires will have the opportunity to develop a talent in music. The Super Duper Academy needs enough instruments to get the class started. These instruments should be in good shape and playable. Each one donated to the academy will be assigned to a particular student, one that they can take home for practice and use in class. We are asking you to please look around your house and donate any instruments that you may no longer need, even if the instrument may need minor repairs. If you would still like to give, but do not have an instrument, consider giving a cash donation that can be used for other music supplies or check your local pawn shop for a suitable instrument. Instruments can be dropped off at our front desk or simply call (123)456-7890 and we will be happy to drop by and pick up the instrument. It is through generous donations like yours that the Super Duper Academy has been able to provide life changing classes and experience to thousands of special needs students over the last five years. We could not do it without you. P.S. – We would like to invite you to our open house on August 31, 2010 at 6:00 PM to meet some of our students and to learn more about our programs. On June 16th, 2009 I will join thousands of others on a 20-mile walk as part of the MyCharity Walk-a-thon, an event that raises money for MyCharity and the fight against breast cancer. The goal of this event is to increase awareness of breast cancer, to highlight stories of survivors and to raise money to help fund research into curing this deadly disease. I am writing you to ask you for your support for this event and cause. I know firsthand what it is like to lose a loved one to breast cancer. My mother passed away five years ago after losing a three year battle with breast cancer. If she had been more aware of the risks of breast cancer, perhaps she would have sought medical attention sooner. I believe she is proud of my efforts and I like to think she will be walking beside me on this 20-mile event. Please read the enclosed brochure that further describes MyCharity, its goals and details about our event on June 16th. Then determine how much you will pledge to help sponsor me in this event. You can make your pledge directly at www.mycharity.org or can mail your donation, along with the enclosed donation form to MyCharity. Last year I was able to raise $2750. Will you please help me reach my goal this year of $3,500. Thank you for taking the time to learn more about breast cancer and my efforts to end it, something I wish for so that others do not have to go through the experience of losing their loved one early. 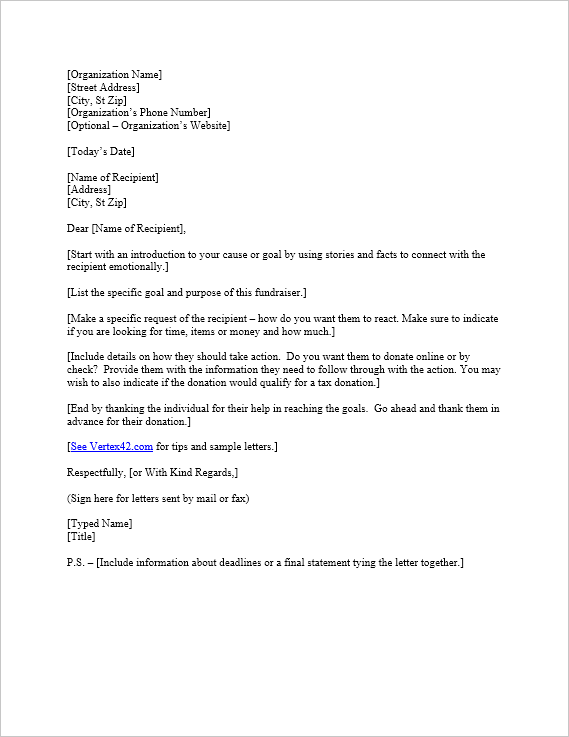 Donation Form by Vertex42.com - A customizable and printable form to send to potential donors. Disclaimer: The content on this page is intended for educational use and not to be construed as legal or professional advice.